The opening phrase of ‘Maiden Voyage’ is as an evocative piece that Jazz has ever produced. It reflects the ebbing of tides and the gradual launch of a vessel. 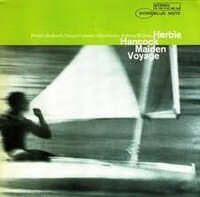 By the time ‘Maiden Voyage’ was recorded, Herbie Hancock had acquired an impressionistic quality to his writing, so much so that you can visualise the pictures he is painting with his music. Freddie Hubbard’s Coltrane inspired solo sets the scene on ‘Maiden Voyage’, which Hancock builds on eloquently. This is genius at work. Alongside the album’s closing track the sublime ‘Dolphin’s Dance’ ‘Maiden Voyage’ provided Jazz with two of its finest compositions ‘The Eye Of The Hurricane’ engenders a more tumultuous phase with Hubbard’s horn and George Coleman’s muscular tenor adding the required tempestuous flurry of notes. ‘Survival Of The Fittest’ is an intriguing track as it oscillates between a strong groove and the more experimental. Maiden Voyage’ was recorded on March 17 1965 and apart from Hubbard the band were either present or past members of Miles Davis’ quintet. The rhythm section of youngster Tony Williams and the glowing bass of Ron Carter are particularly powerful.